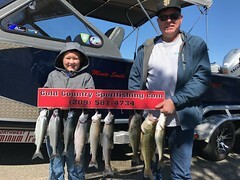 New Client Steve and his son-in-law Jason were onboard with me on Saturday October the 28th to hopefully catch king salmon. 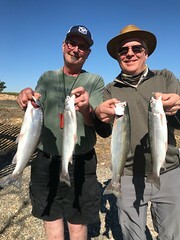 We met up early and headed down stream, after some instructions on what goes on when a fish is hooked up, I started setting out the rods, I set the two back rods and had the third in my had when they hollered FISH ON! 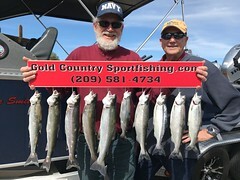 the first rod was violently bouncing hard as Steve grabbed the rod while Jason cleared the other and very quickly we had our first fish of the day in the boat, after rebaiting and heading back up river, we maybe went a 100 yards and BAM!! fish on again on the same rod, Jason grabbed the rod and we had yet another fish in the boat, instead of heading back up river we kept going and with another 100 yards the same rod goes down again and since Jason was standing there he soon had his limit of king salmon, so now we needed just one more fish for Steve, however that chance never came. Still a great day with two great guys. Thanks again!!! !